When you are thinking about what to have for lunch or debating quick and easy breakfast options, wraps are an easy choice. Not only is a wrap fairly easy to make (throw a bunch of things inside and wrap it up! ), but they are versatile as well. You can put just about anything into a wrap! This is exactly why wraps are a food that many people have on their list of foods they can’t live without. However, once you are on a paleo diet, traditional wraps may be off limits. Not only do you need to think about what is inside your wrap but you also have to be aware of what is in the wrap itself. Hidden sugars, overly processed ingredients, it all no good when you are switching to a paleo lifestyle. So, unfortunately, on a paleo diet, you will need to say goodbye to traditional tortilla wraps. Before taking a deeper look at wraps and what options you may have while on a paleo diet, it is important to explore why, exactly, the paleo diet restricts these foods. What is the paleo diet and why are people following it? What effects will it have on you and is it worth changing your life completely to abide by paleo rules? Let’s take a look! A paleo diet is based on the way people during the Paleolithic period ate food. Of course, back then, there were no processed foods and everything that was consumed was either hunted or found in nature. So, when thinking about what foods you can eat while following this diet, just consider if a caveman could have eaten it. If it is packaged in a box, chances are it is off limits. It is a food that is mass manufactured? Then the answer if you can’t eat it. Is the food full of processed sugars? Then that is a big no. You may be wondering why people would want to revert to the caveman days. Isn’t the idea of a society to move forward in all we do, including how we eat? You would think that packaged foods would be a societal benefit- we figured out how to preserve food, create new and exciting foods and have flavors and tastes that have never been available before. Why is this bad?! Well, the reasoning behind eating like caveman is simple- there was just less crap back then. Cutting out modern foods and returning to a hunter- gatherer way of life means you consume less “bad stuff”. Obesity, heart disease and diabetes are all illnesses that are relatively new to the human race when you consider how long we have been on this planet. Many point to diet and our current lifestyle of convenience as the reason why these diseases are so common. There was no obesity in cavemen! No hunter-gatherer ever had heart disease! The fact that these diseases and conditions were non existent back in the caveman days leads many to believe that our modern diet is the main cause of the problem. Eating processed foods and consuming food in the manner which we currently do may be what is causing all of these health problems. The easiest way to fix this is to stop eating those ‘modern’, unnatural foods. Reverting to a caveman way of eating is how many are choosing to resist heart disease, obesity and diabetes and this is where the Paleo diet steps in. Sounds pretty logical, right? Well it is! And many who have switched over to this way of eating have seen many health benefits first hand. However, it is making that initial switch that is the challenge. It is not always easy to give up the foods you are accustomed to eating even if you know the benefits will be great. A lot of the challenges come from giving up foods that are convenient. We all know how easy it is to reach for a bag of chips to curb our hunger or make a quick lunch wrap to throw in our bag for work. These are the things that have to be changed and adjusted when you start on a Paleo diet. It might not be easy, but it will be worth it! So what exactly can you eat on a paleo diet? Well, we have already mentioned that everything needs to be something that a caveman could have eaten. The exception to this is that the diet isn’t as strict about how the food is prepared Did a caveman have a fridge and a six burner range with a convection oven? No, but you might and on this diet, it is okay to use modern appliances to prepare your foods, just not eating “modern” foods themselves. Meats are one of the biggest categories of foods available on the paleo diet. Cavemen obviously were hunters and enjoyed all types of games. Pretty much all meats are fair game on a Paleo diet which is great since this allows for a large variety of foods. Vegetables are also a major player in the diet and also something almost every diet out there agrees is beneficial for our health/ Load that plate up with any veggies you can find! Fruits are another acceptable food group to the paleo diet. Fruits are ideal as they are good for practically anything- breakfast, snacks or even dessert! Thank goodness these are on the paleo diet! Herbs, spices, seeds, nuts and healthy fats and oils are all part of paleo as well. A sprinkle of spices, a handful of seeds paired with some veggies, meats and fruit for dessert- it sounds like a delicious meal! Specific things that you can’t eat while following a paleo diet include processed ingredients like granulated sugar, corn syrup, candy or even ice cream. There goes a lot of your favorite sweets! Modern pastas, wheat, barley, beans and most dairy also make the list of things you cannot eat. Trans fats? Those are a big no. Artificial sweeteners? No as well. All of the ingredients and foods that are on this negative list are made in factories, heavily processed and barely resemble the food that they were derived from making them not compliant with the paleo rules. This long list of things you can’t eat is also tricky as many of these ingredients have a tendency to sneak their way into your food unknowingly. You many go to a restaurant and order a steak and broccoli and think that you are following your diet restrictions. However, little did you know that the restaurant sauteed that steak in butter and also covered the broccoli in a sauce that contained sugar and trans fats. Oh no! Now what? How can you rest assured that what you are eating is paleo friendly? The main thing to do is ask and read. If you are out to eat, ask what the ingredients in each dish are to assess if you can have them. If you are grocery shopping, read labels and see what is in everything you want to try. Another rule to adhere to is to shop only on the outside edge of the grocery store where the fresh, natural foods are typically found. Those middle aisles are where all the processed foods are kept so avoid them! The outside aisles are where paleo friendly foods can be found. OKay, so by now you have a pretty good grasp on the paleo diet. You can see why people are following it and also all of the rules you need to follow. But the biggest question is, what can you eat that is easy? What can you pack for lunch? What about those wraps that you love? We mentioned that the traditional type of wrap you may love is off limits. But what if you just can’t imagine a world without wraps? There has to be another way! And there is! So don’t get too upset just yet! There are plenty of ways you can still enjoy a wrap while on a paleo diet. In fact, you may like these nontraditional wraps even better! 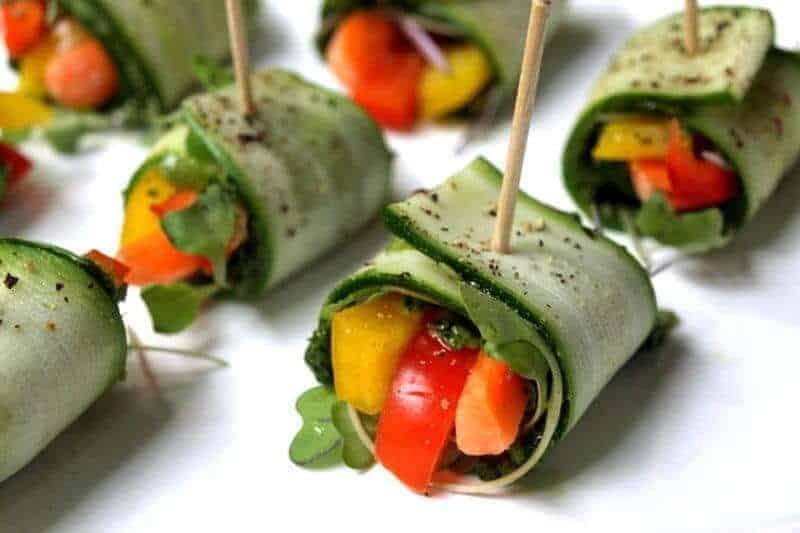 Not only are there some super health options for making a wrap but there are also versions that are so full of flavor, you will forget that you are even on a diet. When thinking about a paleo friendly wrap, the first thing you should take a look at is the outside wrapper itself. The so called “wrap”. You need a “wrap” after all to make a wrap! Tortillas are the typical go to when making a wrap and for good reasons. They are easy to roll, hold their shape and can be found in a lot of different flavors. But when you really look at the ingredients in that “spinach” tortilla wrap, you may find that it is all chemicals, additives, sugars and barely any spinach at all. What kind of nutrients are in that processed wrap anyway? Not many. In fact, studies have been done which show that eating those “healthy” wraps are worse for you than eating regular old bread. The wraps contain all types of preservatives and additives that are not natural and not beneficial to your health. Even if you aren’t on a paleo diet, those wraps should go in the trash. They really are a food that is just marketed to be healthy when they really are not. Of course, store bought tortillas are packaged items which the paleo diet frowns upon anyway. It is, afterall, a super processed, packaged product. If that wasn’t enough of a signal to stay away from these wraps, you can always try out the old caveman test- were wraps available to cavemen? Could they have even made them on their own? Probably not. There aren’t any pictures drawn inside caves of a caveman enjoying a nice spinach wrap, thats for sure! So in addition to not being exactly the healthiest choice to begin with, those store bought tortillas are clearly not paleo friendly. That means-off the list! But again, once you look at the massive amount of grains and carbs in a tortilla, you won’t want it anyway! No harm done. Without tortillas, what are you going to make your wrap with? Well, you will be shocked by how many options you have. These wrap recipes feature some fantastic ingredients that you can use to hold your sandwich together. Everything from seaweed to lettuce, homemade nut tortillas to coconut flour tortillas can be found here. So many creative options that will also add a ton of flavor to your wraps. You thought that store bought spinach tortilla had a decent flavor? Well wait until you try a wrap made with seaweed- now that is flavor! The overall health value of your tortillas is going to go up as well. Many of the wraps used in these recipes contain vegetables which is a beneficial and wholesome way to add nutrients to your paleo diet. Coconut flour and nut flours also have their own long list of vitamins and minerals that they contain meaning the tortillas they create will not only be delicious but healthy as well. These whole food options are much healthier than a store bought wrap and no one can dispute that. As you can see, there are many options for wrapping up your wrap. Tortillas are a thing of the past! Time to move on to bigger and better things. If your mouth is already watering just thinking about the delicious wraps you are going to make, just wait. We’ve only discussed what is on the outside of the wrap- wait until you see some of the things that are wrapped up inside! Veggies and meats, homemade sauces and dressings, even some fruity options thrown in there- what you can put inside a paleo wrap is endless. Toss some seeds in with a roasted beet wrap of smear a paleo friendly nut butter across a seaweed wrap for a fun flavor profile. It is actually impossible to list all of the things you can do (luckily there’s 50 amazing recipes right below on this page!)! One thing we can say is that you will never get bored of wraps when on a paleo diet. While the diet may restrict some foods, the wide amount of available ingredients for wraps rings true. That is why they are such great choices when on this diet! 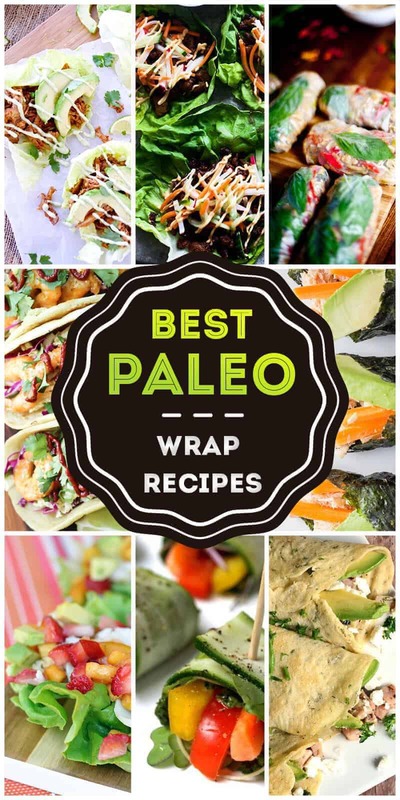 It may already be clear to you but with these paleo wrap recipes at your fingertips, you are never going to get bored of eating wraps. You need variety in your lunchbox and at your dinner table every day especially when you are following a paleo diet and this is where you will get it! 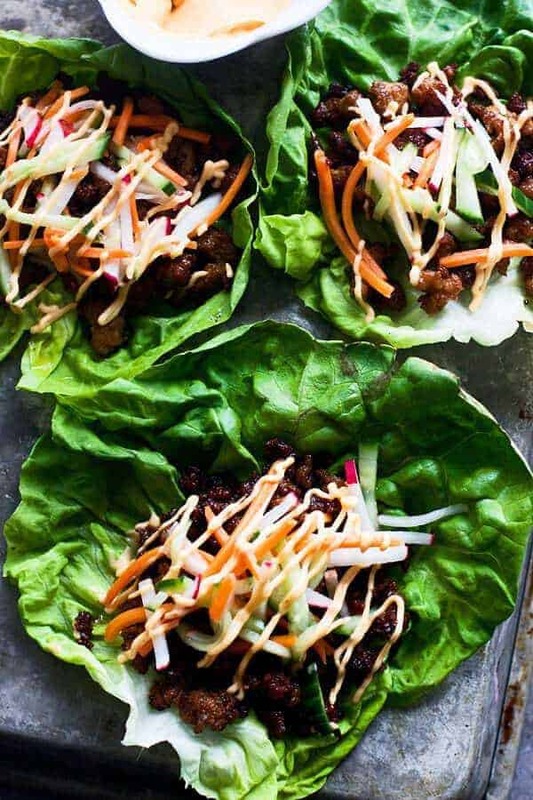 So, whether you are just starting out on a Paleo journey or have been eating Paleo for years, you know by now that you need to skip the store bought tortilla and try one of these new, creative, tasty wraps. Bye bye tortilla- you are now officially a thing of the past! Hello to some of the most delicious, healthy and easy to make wraps that you have ever tried. It seems safe to say that these wraps are going to be on everyone’s weekly menu soon! If you love Pad Thai, then you will be obsessed with these wraps. They make a favorite dish portable which is a must for wraps. There is a bit of prep involved but they come together wonderfully and you can plan ahead and eat them for days. 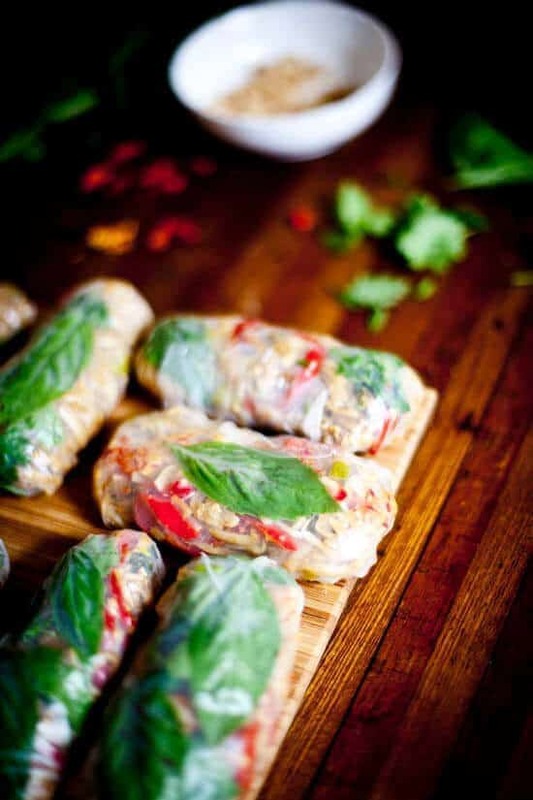 Rice wraps are filled with rice noodles, shrimp or tofu, peppers, basil, cilantro and a Thai peanut sauce. These Pad Thai Wraps are gorgeous and would look great served at your next party (or just packaged beautifully in your lunchbox!). 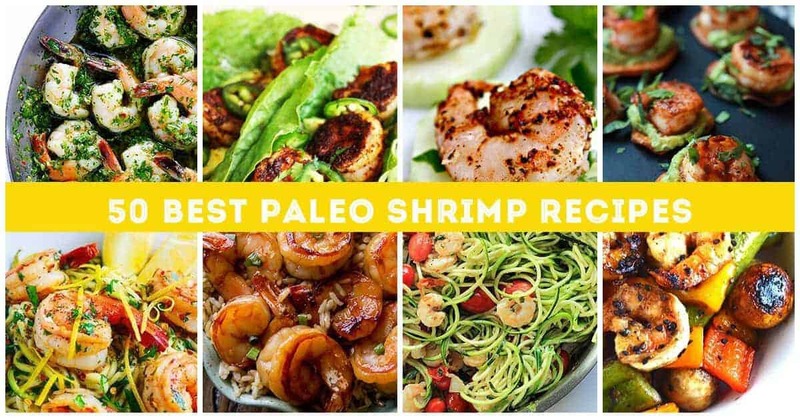 This recipe proves that Paleo food can be easy and delicious! With all Paleo-friendly ingredients, this recipe will make your day complete. 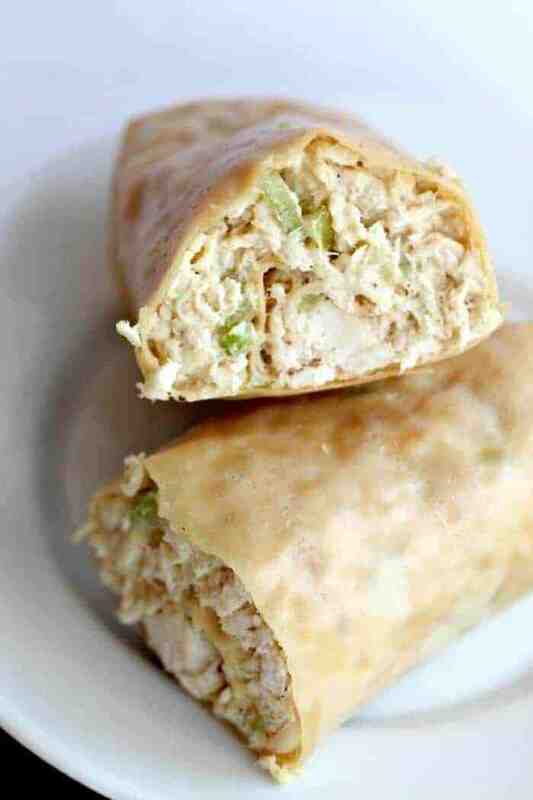 The chicken salad can be made separately ahead of time and used to make fresh wraps in just a matter of minutes. Also included is a Paleo recipe for mayo that you will want to hold on to. Rather than giving in and using store bought mayo, I recommend you take the extra few minutes it takes to make your own. For those of you who miss having a tortilla wrap, you are in luck. 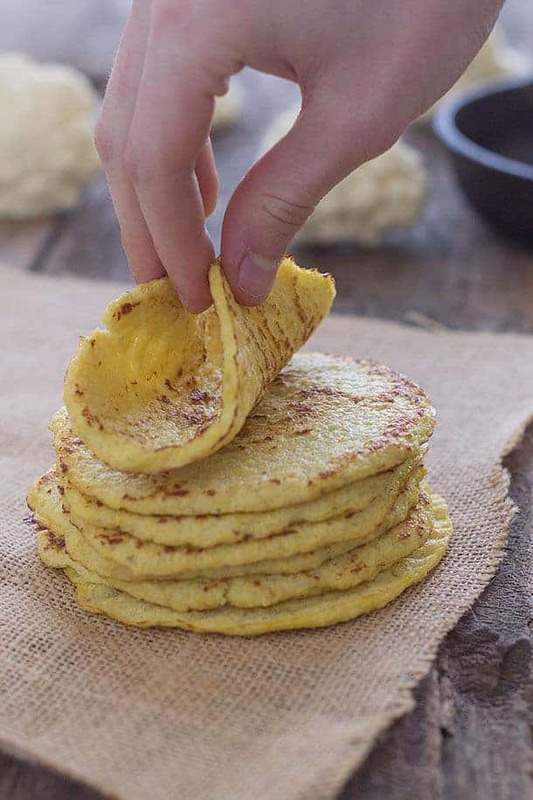 Paleo tortillas do exist and you can make them yourself! These are way better than store bought and since you are making them at home and you therefore know every ingredient inside. If you have ever made a paleo pancake before, these tortillas will be a piece of cake for you. If you haven’t, you will still find them easy to make! With only 6 Paleo-friendly ingredients you are well on your way to making fresh Paleo wraps. 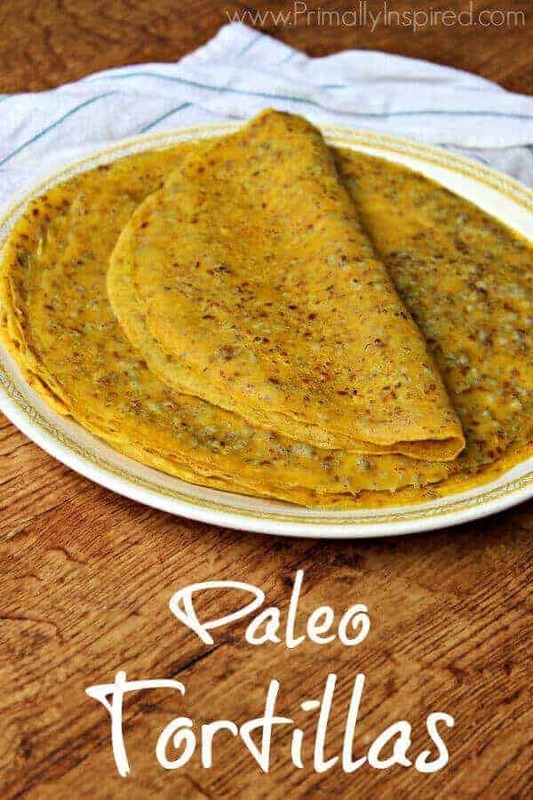 Another option for a homemade tortilla is this great flaxseed based Paleo recipe. These tortillas are just as easy and just as quick to make as they are to eat. These include heart-healthy flaxseeds that make the tortillas nice and pliable without using flour. The tortillas can also be made very thin without them breaking or falling apart. They also use a smaller amount of flaxseeds than other flaxseed wraps typically use which makes the flavor more subtle. 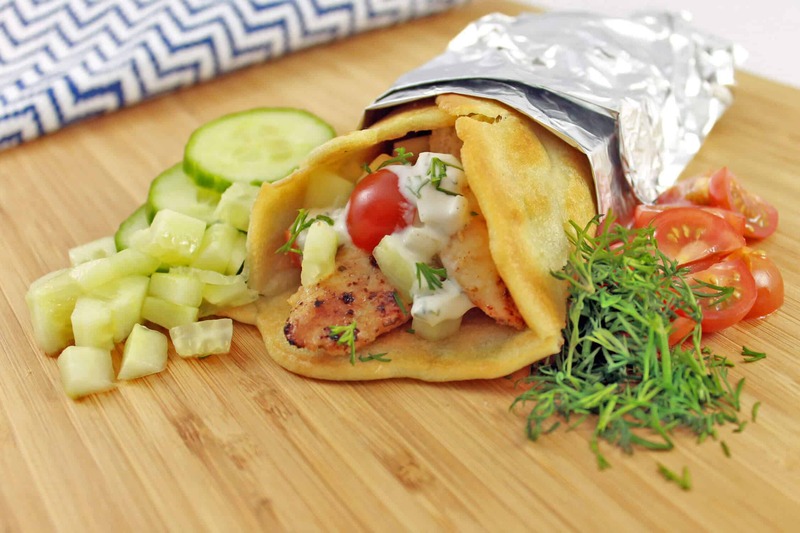 This Paleo chicken gyro is a lighter take on the traditional Greek gyro that uses lamb meat. 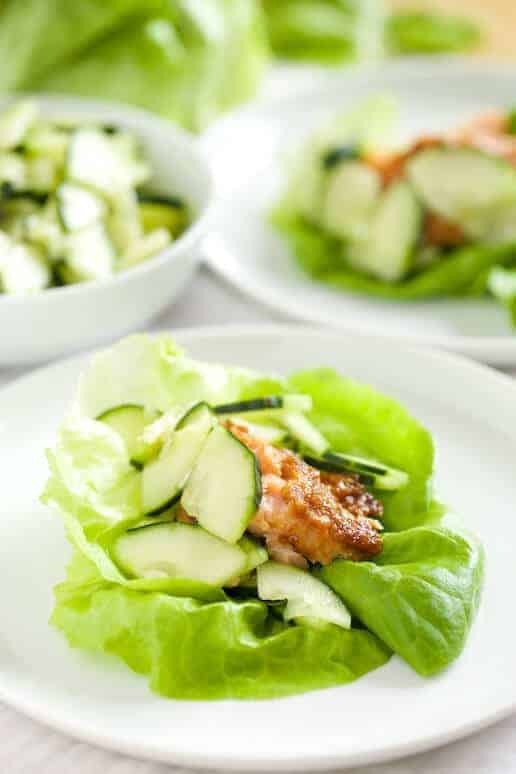 Delicious Greek lemon chicken is wrapped in a gluten free Paleo wrap with veggies and topped with a delicious dairy free cucumber Tzatziki sauce. 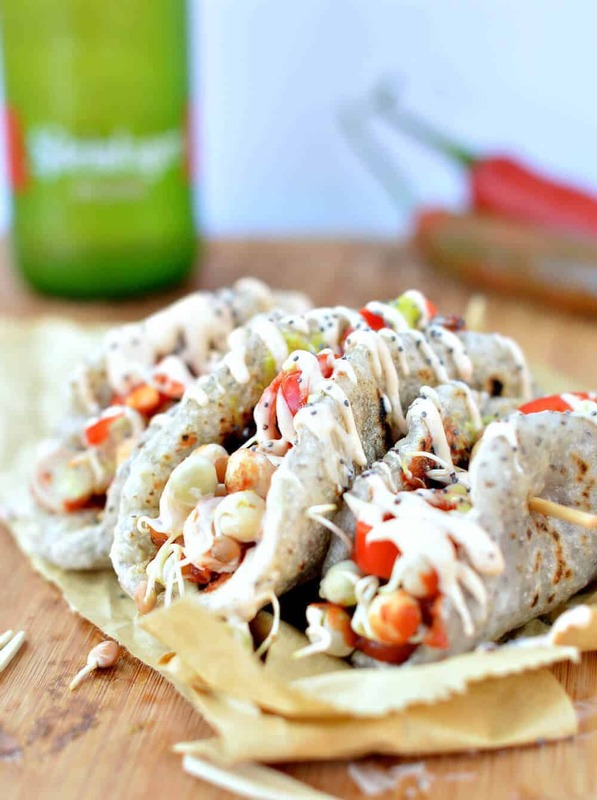 These gyros are reminiscent of food truck and street food but you can make them at home in your own kitchen. Serve these your friends and they will be begging for the recipe. 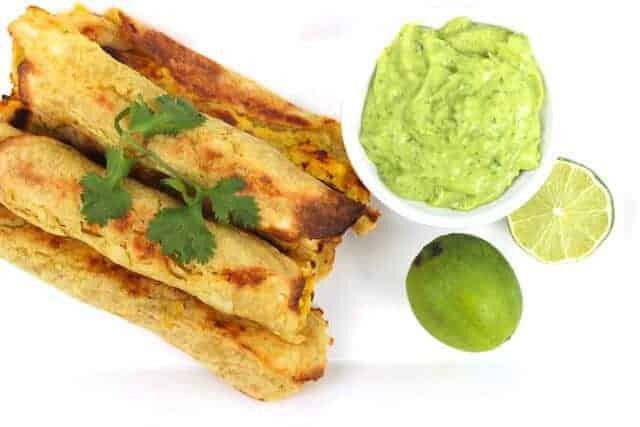 These tortillas are made with all purpose gluten free flour and pureed zucchini. 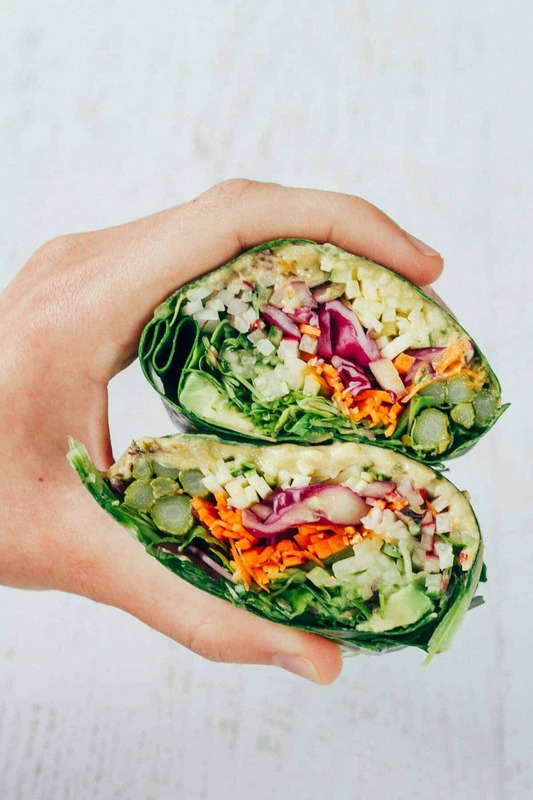 They even have a lovely green hue that will make your Paleo wraps look extra festive and you will rest assured knowing that there are actual veggies in each wrap! Aside from allowing the dough to sit for 20 minutes, this easy recipe comes together very quickly. Not only do they look healthy but they ARE healthy. Each tortilla has about a half a serving of vegetables- you can’t beat that! 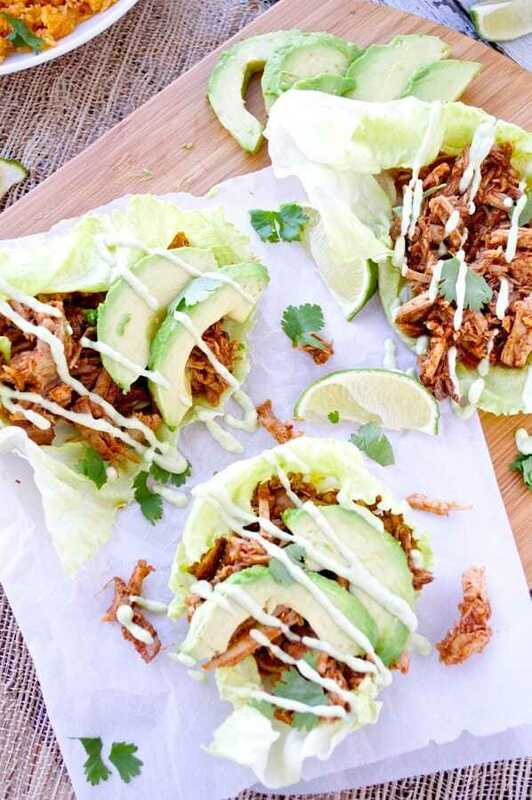 This recipe uses slow cooked chipotle pulled pork and avocado in a lettuce wrap. You can’t go wrong there! Drizzled with the avocado aioli and garnished with limes and cilantro, this wrap will make your mouth water- it probably is already! If you like guacamole you will love the avocado aioli. It is described as liquid guacamole and can be drizzled on anything your heart desires. The next time you are tempted to go out to eat, skip it and get in the kitchen and make this instead. This is Paleo food at its finest! Inspired by Golumpki, a traditional Polish recipe, these Asian-style cabbage wraps are stuffed with meat, veggies and a delicious Asian sauce. Using all Paleo-friendly ingredients, and baked to perfection, these wraps are sure to please. You can include these Paleo wraps at your next holiday celebration and everyone will think you spent hours in the kitchen. With this recipe, no one will be disappointed! 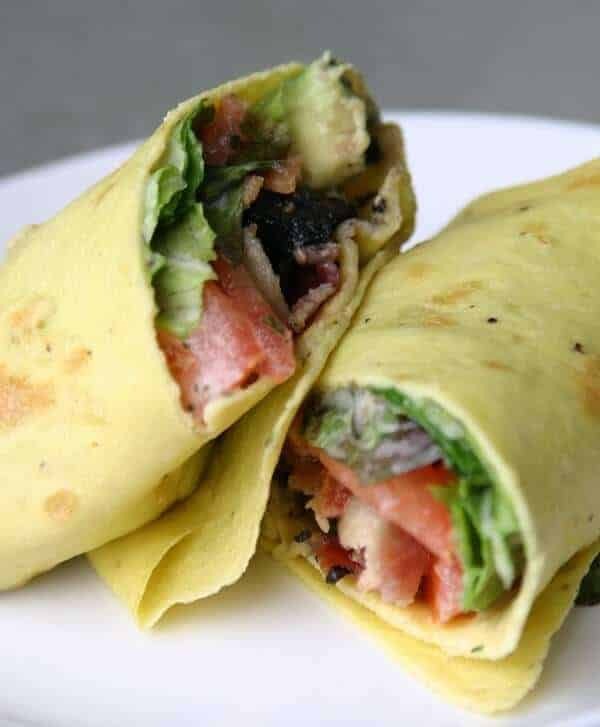 These Paleo and gluten free wraps are super easy with only a few ingredients. They come together super fast and taste amazing! You can whip up a whole bunch in a matter of minutes. These can be used to make wraps, tacos and gyros. The possibilities are endless! These wraps can be used in almost any of your Paleo wrap recipes. 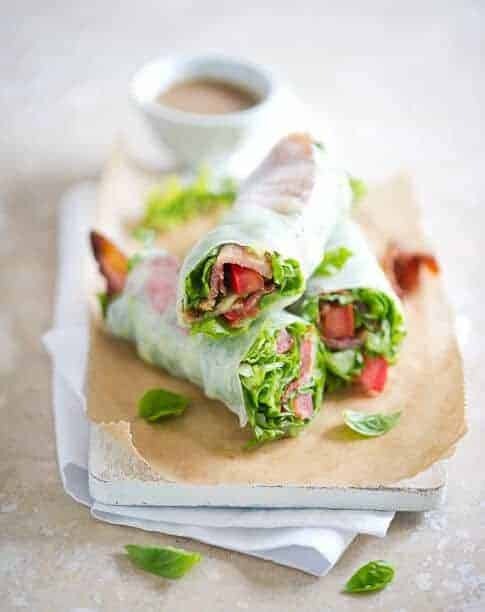 These wraps use coconut flour and coconut milk which can be a little expensive, so these make a nice rare treat (they are well worth the price!). These fish tacos are a real Summer treat. Instead of tacos in the usual taco shell, these fish tacos use a lettuce leaf- Paleo friendly! They also incorporate a fruit salsa using seasonal peaches and strawberries. If you have had fruit salsa before, you know how great it is. If you haven’t, you don’t know what you are missing and you need to get into the kitchen and make this right away! The salsa only takes minutes to make and is really what makes these tacos so fantastic. Peppers, onions and zucchini are wrapped in steak and drizzled in a delicious balsamic glaze in this Paleo recipe. These rolls take a little extra work but are definitely worth it. Not only are they delicious but they are also very pleasing to the eye. These would be great for a Summer party or a holiday get together. You could also try experimenting with different veggies depending on what is in season and what you like best paired with your steak. One thing I love about my Paleo diet is that it challenges me to try new things that I would never have thought of before. This is one of those recipes. Your choice of savory herbs and seasonings are blended with eggs and coconut milk to make these crepes. You will have to take a trip to Whole Foods to get your hands on some sprouted watermelon seeds to make the flour. How many people can say that they made flour out of sprouted watermelon seeds? Now with this recipe, you can. So cool. These Banh Mi lettuce wraps are made using leaves of lettuce filled with a saucy ground pork, pickled veggies and drizzled with a spicy mayo. This recipe is super easy and comes together very fast. You will hardly spend any time in the kitchen for this paleo recipe. Just make up the pickled veggies and allow to marinate while you cook up the pork. Make up the mayo and throw it all together in minutes. Easy peasy! 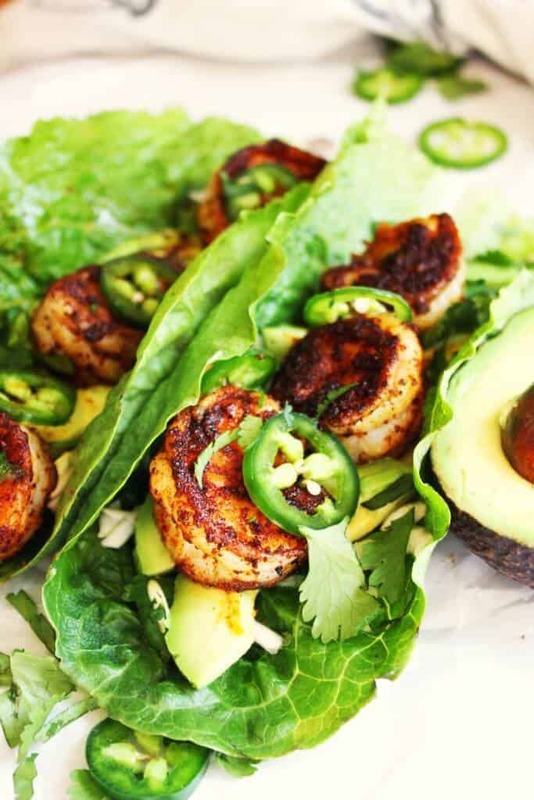 These Paleo bang bang shrimp tacos are a refreshing change to the ordinary tacos we are used to. The fluffy tortillas envelop the crunchy shrimp making a lovely balance of soft and crunch. The bang bang sauce will delight your taste buds. 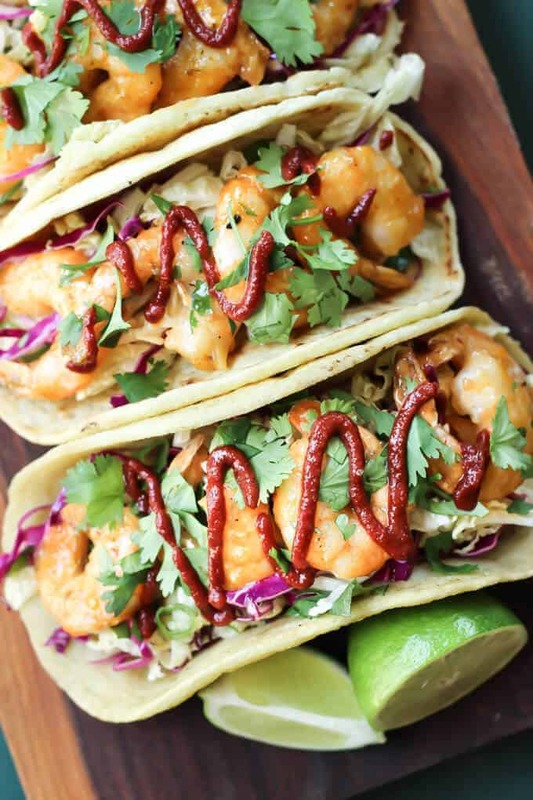 Topped with a tangy slaw these tacos have a perfect blend of spice and tang. This easy recipe will most likely become a repeat occurrence in your kitchen- you are just going to love them that much! 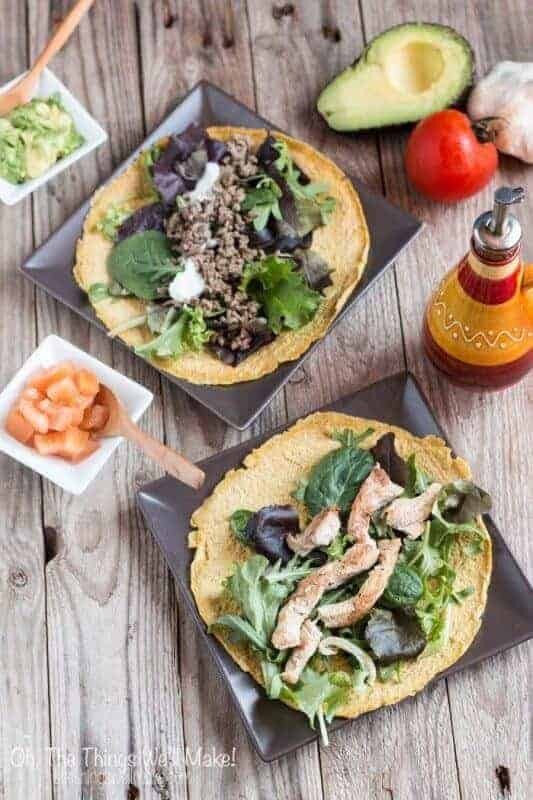 Garnish these tacos with lime wedges and you will have a picture-perfect presentation of Paleo food! This easy recipe is both fast and fun to make. Peppers, carrots and sprouts are wrapped up in slices of raw zucchini with a delicious kale pesto sauce. The zucchini are sliced lengthwise and wrapped around the veggies and pesto then held together with a toothpick. They make a beautiful presentation and are completely raw- another goal of many on a paleo diet. Raw Paleo wrap recipes are also the easiest to make since they require no cooking. Simply prep your veggies and throw them together. These are great for Summer and you don’t have to heat up your kitchen by using the oven. This is one of the easiest Paleo wrap recipes we have. 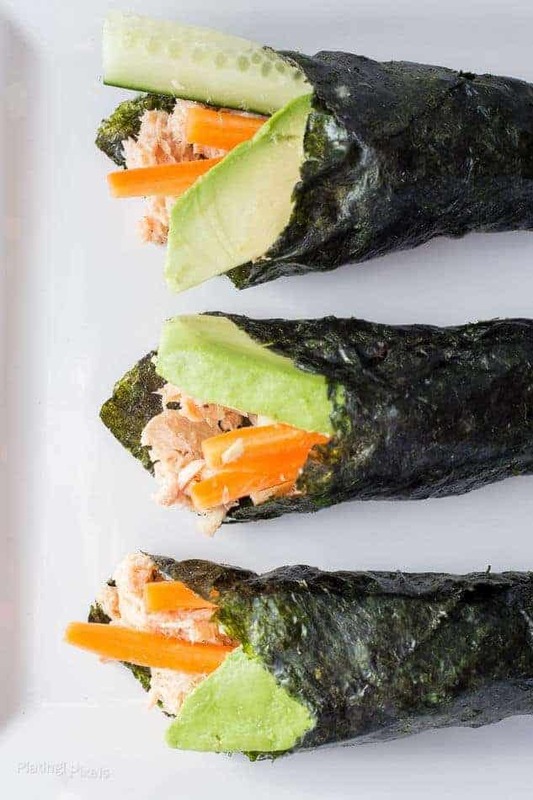 These are sushi style nori wraps and they are delicious and super easy to use! Simply mix together canned tuna, coconut milk, olive oil, lemon juice, cumin and salt to make the tuna salad. 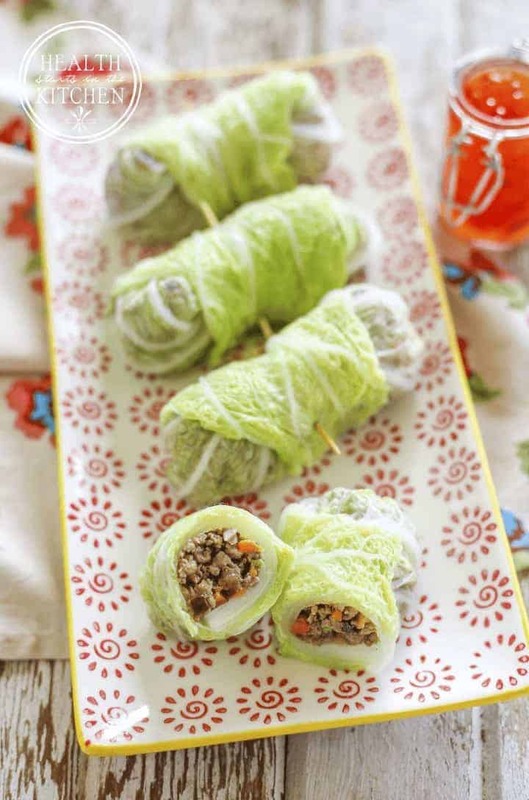 Spoon the mixture onto seaweed nori sheets, top with veggies and roll up. Tada! For best results these wraps should be served immediately, not that you would really want to wait anyway. These Paleo turkey avocado wraps are incredibly easy. In this easy recipe we ditch the tortilla and use turkey deli slices as the wrap. 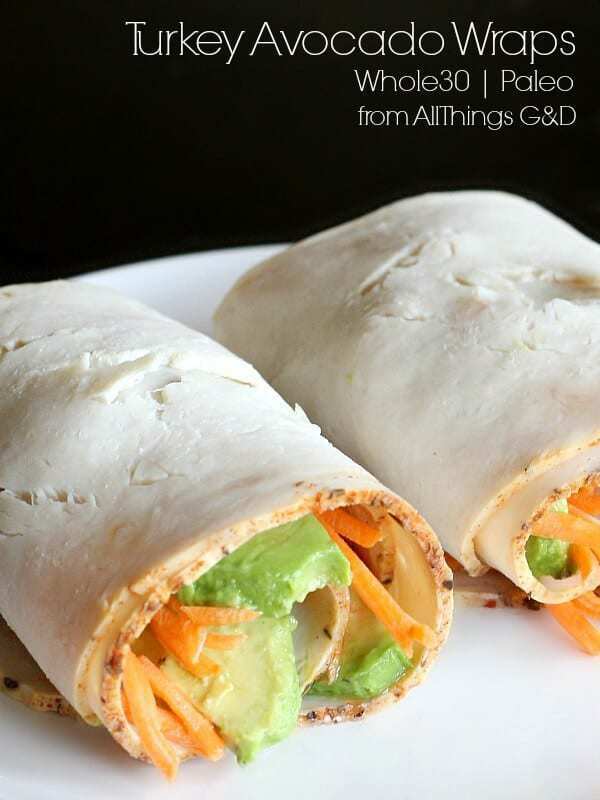 Avocado and shredded carrots are wrapped up in slices of deli turkey and drizzled with a Paleo friendly dressing. These could be made for a party or for a quick meal or perfect snack. These are so easy that even kids can make them. You can try experimenting by wrapping up your favorite veggies in the turkey or using different dressings. This chicken salad is unlike any other chicken salads you are familiar with. This chicken salad combines chicken with guacamole ingredients rather than traditional mayo. What?! 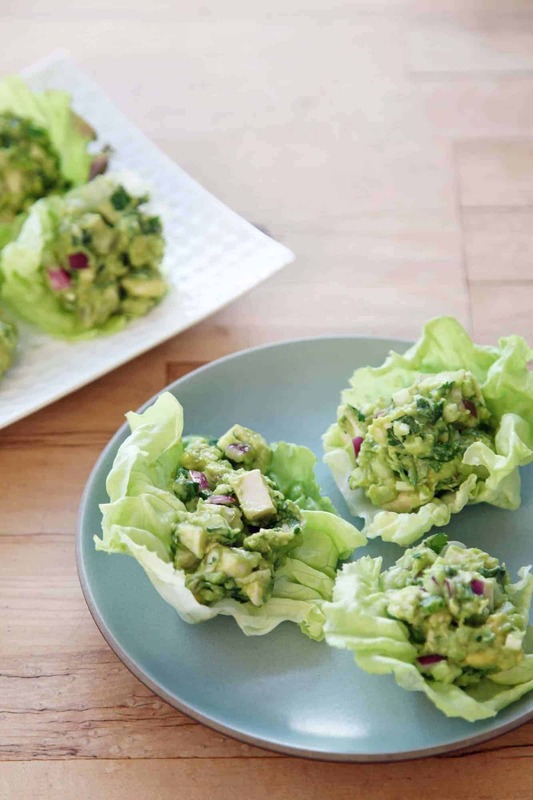 If you love chicken salad and guacamole then this Paleo recipe is a must try! Even if you don’t normally love chicken salad, this recipe claims to convert the haters and we don’t doubt it. Simply use precooked chicken to make this recipe even easier and mash together your ingredients. This easy recipe only takes a few minutes to make. Just pile it onto a lettuce leaf and enjoy! 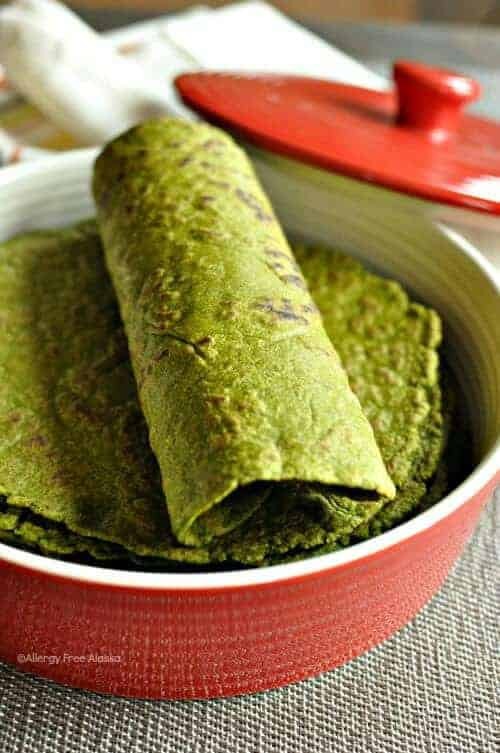 These homemade spinach tortillas are Paleo, gluten free and vegan! They are made with cassava flour which you can find in specialty stores or online. 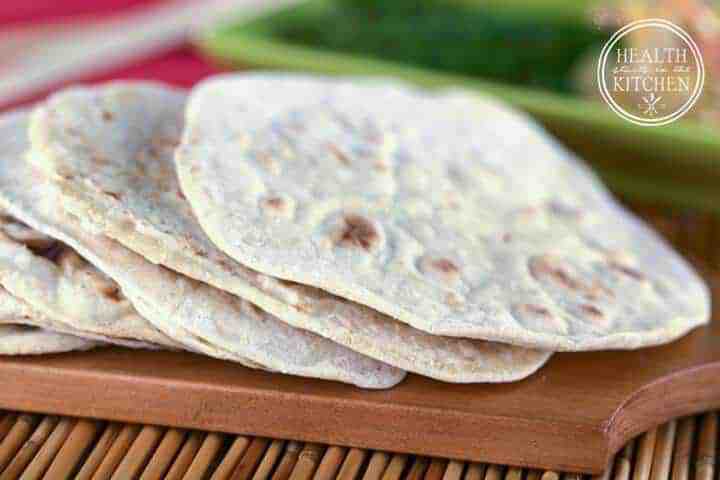 These tortillas are pliable and behave just like regular tortillas. Plus, they are green! They don’t taste like spinach but they are very festive. These are perfect for St. Patrick’s day or just to add more veggies to your already healthy meal. Make up a batch and be ready to stuff them full of delicious Paleo food! Roti, also known as Chapati, is an unleavened Indian flatbread. This roti recipe is Paleo and gluten free. With only 3 ingredients, this recipe is inexpensive and simple to make. This easy recipe comes together with coconut milk, flax seed meal and tapioca flour. The finished product can be paired with your favorite Indian curry recipe or you can use it with your favorite Paleo wrap recipes. You can fill it with your favorite vegetables or dip it in your favorite sauce. Either way, you will be delighted by this recipe. These wraps can be used to wrap your favorite Paleo food. They are made with eggs, sesame seeds, tapioca flour and spices. 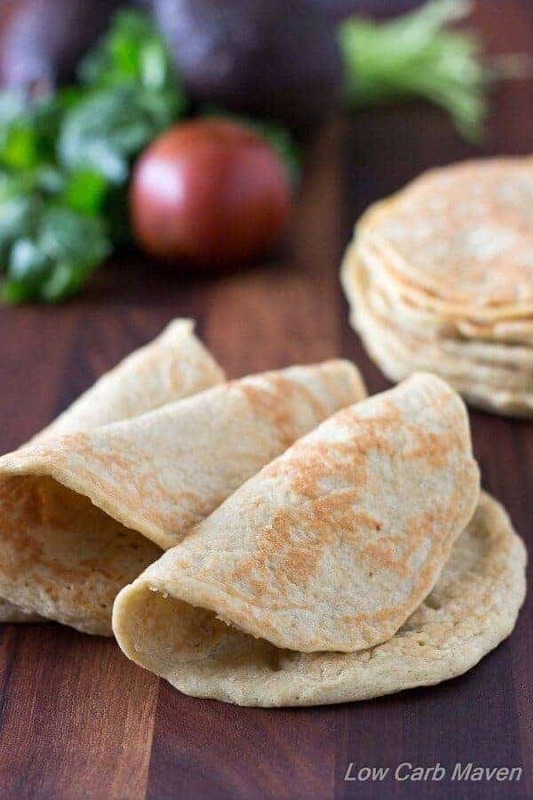 The taste is similar to flat bread or pitas and they fold just like a regular tortilla. These are perfect to be used with your favorite Paleo wrap recipes. Taco, gyros or wraps will turn out great with these Paleo wraps. They freeze and reheat very well so you can make up a big batch and freeze them for later use- so convenient! Cauliflower is a versatile ingredient in the Paleo diet. It can be used to make pizza crust, crackers and even rice. These tortillas are no exception. 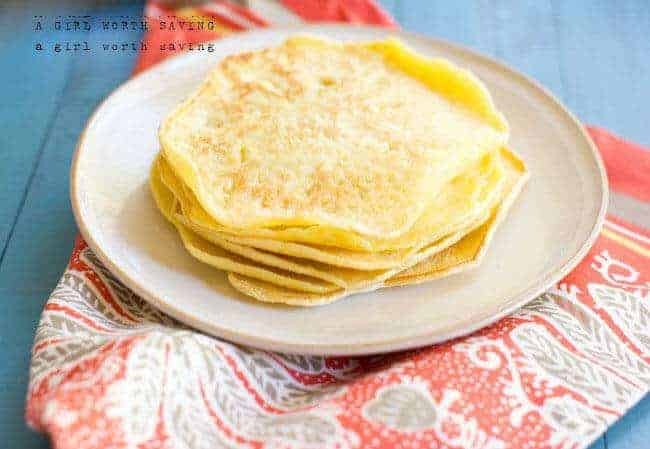 Using only cauliflower and eggs with a little salt and pepper to taste, these tortillas are affordable and easy to make. They resemble a flat bread and have a nice nutty taste. 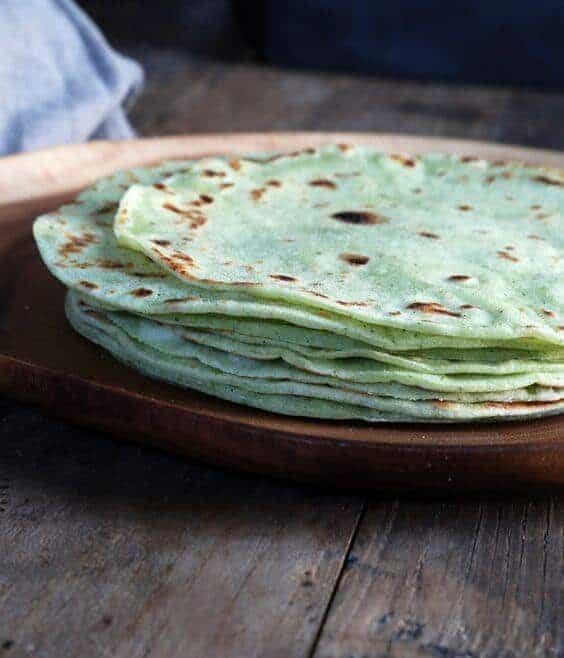 Even though they are a little thicker that a traditional tortilla, they can be used to make all kinds of wraps, tacos and gyros. 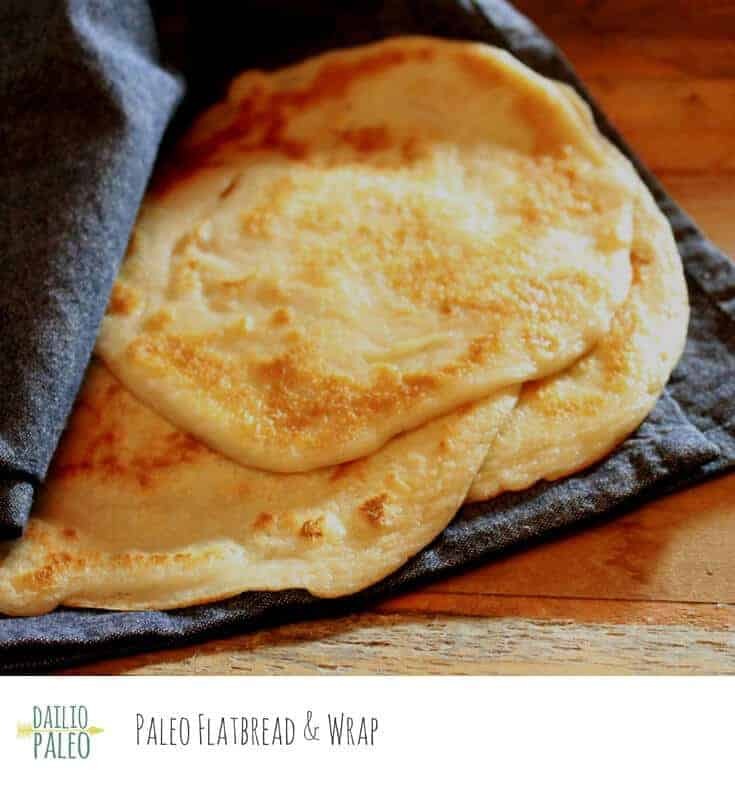 Here is another Paleo flatbread to try. This flatbread is grain free and uses minimal ingredients. 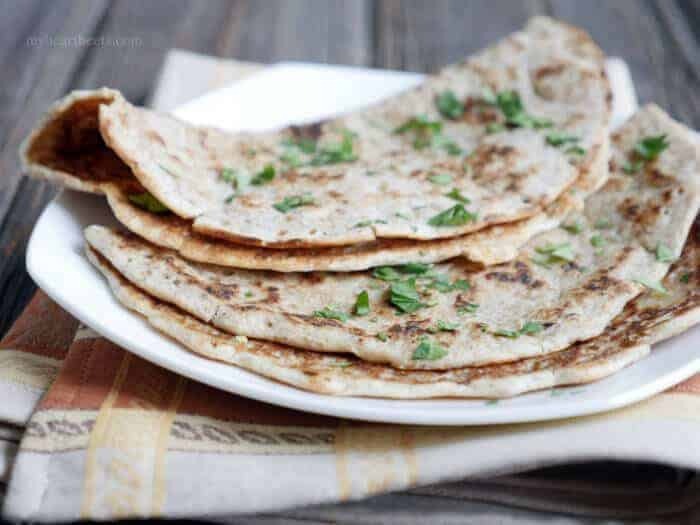 Equal parts almond flour, tapioca starch and water with added spices make this flatbread a delicious alternative to the traditional grain version. These flat breads are first cooked in a skillet then baked in the oven to finish them off. You will not miss the gluten at all and probbly will never even notice it is missing! These can be filled with your favorite Paleo wrap ingredients or stuffed with your favorite Paleo food items. 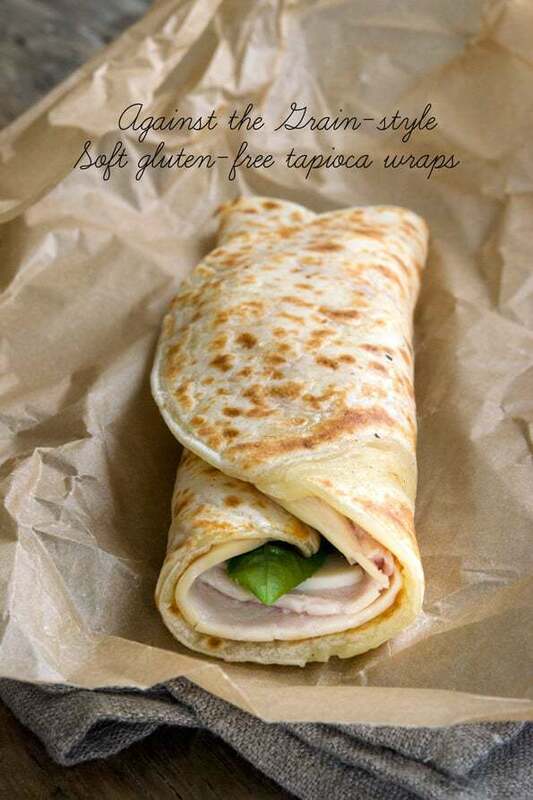 These gluten free wraps are super easy to make and they are pillow soft. You can make the dough ahead of time so you can spend less time in the kitchen when it comes time to make the wraps. Plus they stay flexible even when cold and they freeze well in case you want to make up a big batch and freeze for later use- perfect for meal prep! These wraps are delicious and cheesy. They can be used with your favorite Paleo wrap recipes or served alone. 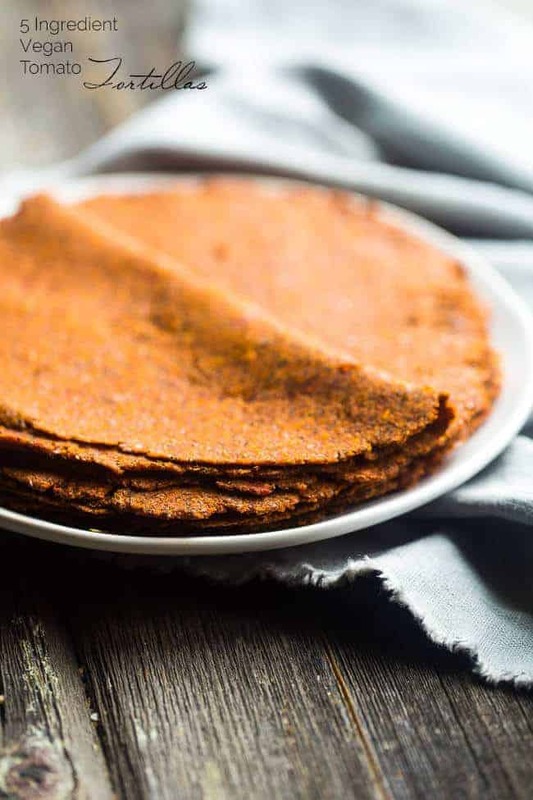 These Paleo tortillas use pumpkin or mashed cooked sweet potato. Not only are they delicious but they are also beautiful. They are pliable and they freeze well. All these things are necessary in a Paleo tortilla recipe and here it all is in one perfect recipe! These can be used in tacos, fajitas, wraps, even in desserts. The possibilities really are endless. Make up a big batch and freeze them so you always have them on hand in the kitchen. Dinners or work lunches will be a breeze with these tortillas. You won’t even miss the traditional flour tortillas of your past. Cold cuts are used to wrap around veggies to make this Italian sub roll up. 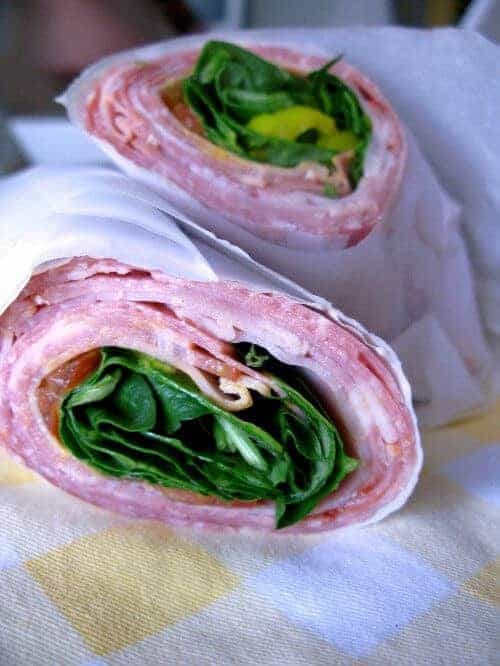 Tomatoes, banana peppers and spinach or lettuce are wrapped inside big deli slices of ham and salami. This is truly an Italian sub minus the bread but you will never miss it at all! This is a perfect option for your lunch box or to make up and take with you as you run out the door. These tortillas are Paleo, gluten free and vegan! Roughly chopped sun-dried tomatoes pair with coconut flour to make this gorgeous rust colored wrap. Not only is it beautiful but it is also robust and tasty. 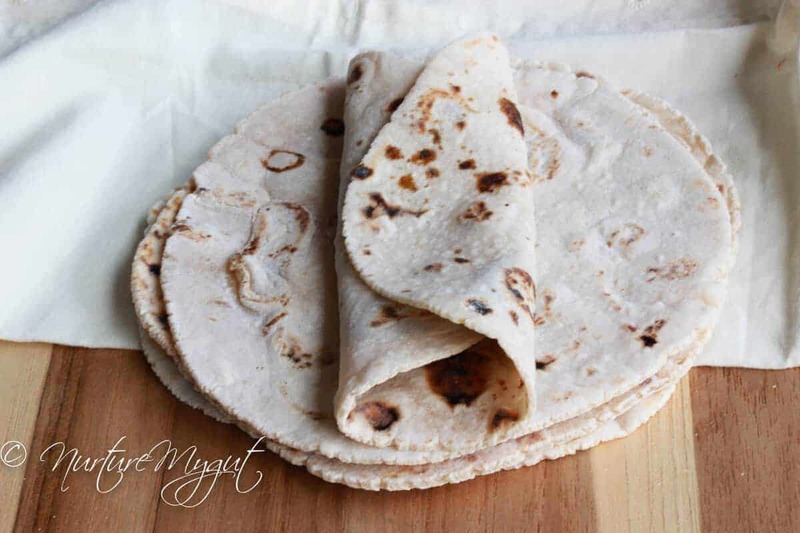 You could go to the store and buy those expensive flavored tortillas that have questionable ingredients or you can use this recipe and make your own. It may be easy to buy them but it is just as easy to make them (and they are way better!). 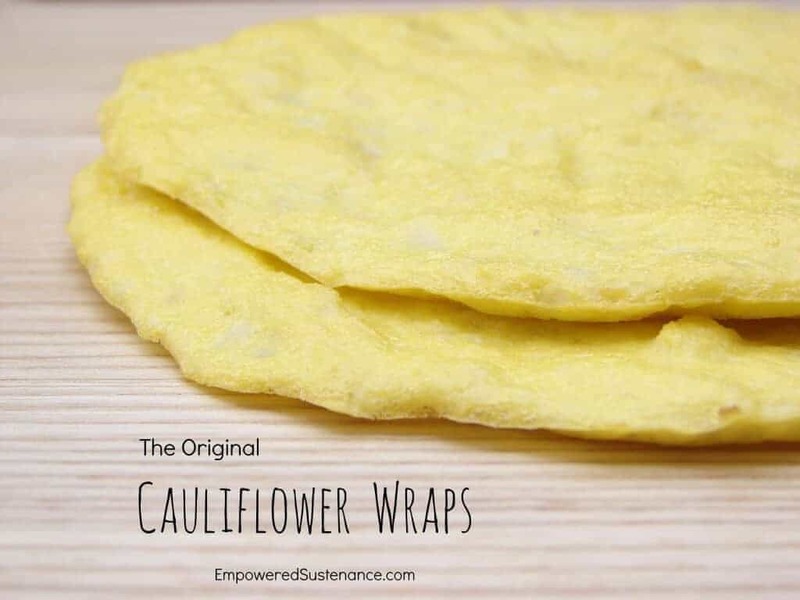 These wraps use cauliflower, eggs and spices to create a soft, pliable wrap that is perfect for filling. These wraps are baked in the oven rather than cooked in a skillet which makes them even easire to make as you can do multiple at once! They can also be used to like a soft tortilla or pita chip to scoop up fillings like salsa. These are best eaten warm from the oven or within 2 hours of baking. 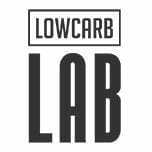 These tortillas are so low carb that they contain less than 1 net carb per tortilla! They are gluten free and contain no specialty ingredients. The main ingredient in this Paleo recipe is pork rinds. Plain pork rinds can be used to create a neutral taste or different flavored pork rinds can be used to make a spicy or savory flavored tortilla. Cook them just like you would a pancake then wrap whatever you’d like! 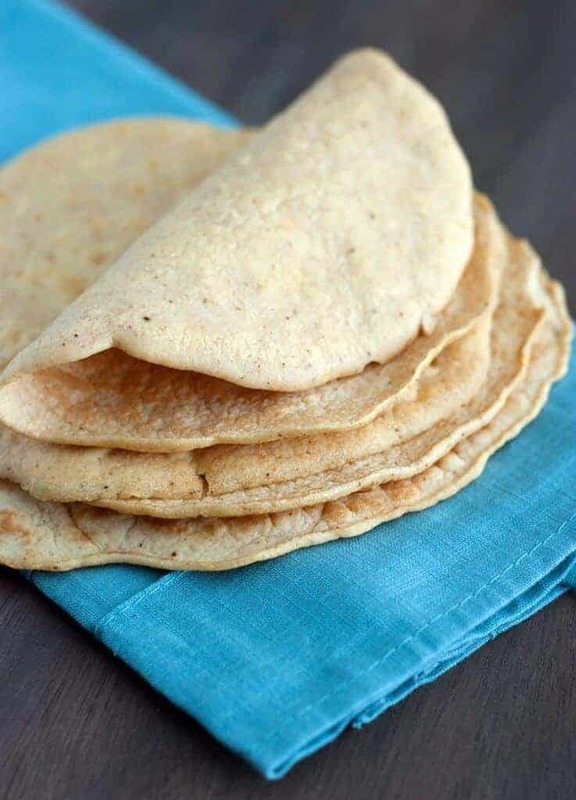 These tortillas are gluten free and dairy free and they are very versatile. They can be used in sweet or savory dishes such as tacos, enchiladas, wraps or crepes. 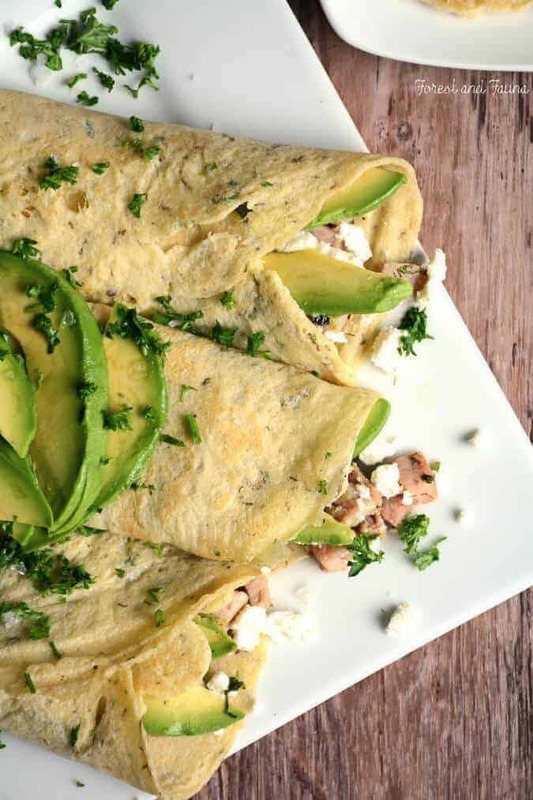 Coconut flour, almond flour, tapioca starch, coconut milk and eggs combine in this Paleo recipe to create a delicious tortilla for all of your wrap needs. These are super quick and easy to make. Chia seeds are combined with tapioca flour, coconut flour and almond milk to make these delicious and chewy tortillas. They are vegan, gluten free and Paleo-friendly. . The black chia seeds give these tortillas their chewy texture that all of your friends will rave about. 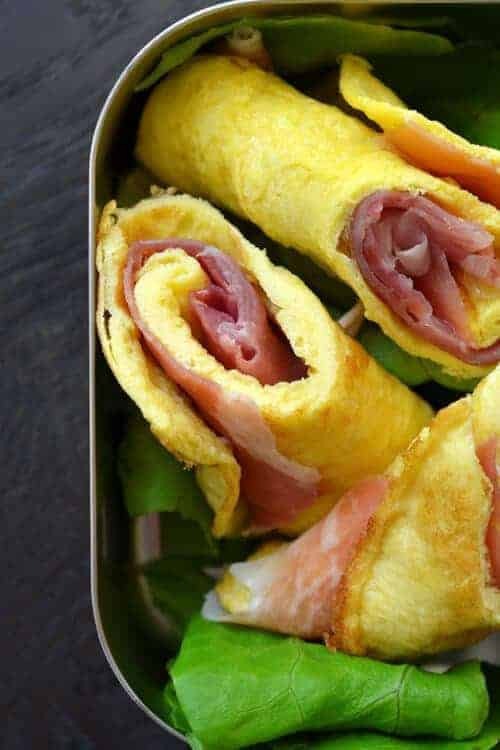 These Paleo prosciutto egg roll ups are great served hot or cold. You can serve them immediately or pack them in your lunch box. The egg is made omelet style and used to wrap the prosciutto, then secured with a tooth pick to keep it together. You could experiment with this recipe and try including vegetables or other meats in the egg wrap. These would make an excellent breakfast as well. A great, versatile wrap recipe you need to have in your arsenal! Collard wraps are similar to lettuce wraps except that they are bigger and sturdier. You can fill collard wraps with more filling without them falling apart or tearing. These wraps are filled with hummus, sprouts and a variety of vegetables. You can experiment using different veggies and wrap it up in the collard leaf like a giant burrito. These are vegan and gluten free and perfect for a healthy Paleo diet. Mashed yucca and plantain are combined to create the shells for these taquitos. The filling is made with chicken and spices and an avocado dipping sauce is made using coconut milk. These taquitos take a little bit of work but they are worth it. Make up a bunch of these for your next party and your guests will leave happy and full! Leftovers would be great cold for a snack or in your lunch box. You can also freeze them and pull them out anytime you’d like them! The salmon in this recipe is marinated in a mixture of miso paste, soy sauce and sesame oil then grilled to perfection. Cucumbers are sliced and tossed with a delicious wasabi dressing. The salmon is topped with the wasabi cucumbers and piled onto a lettuce leaf. The taste resembles sushi and is sure to please your taste buds. So full of flavor, these wraps are irresistible! These wraps are raw, vegan, grain-free and Paleo. 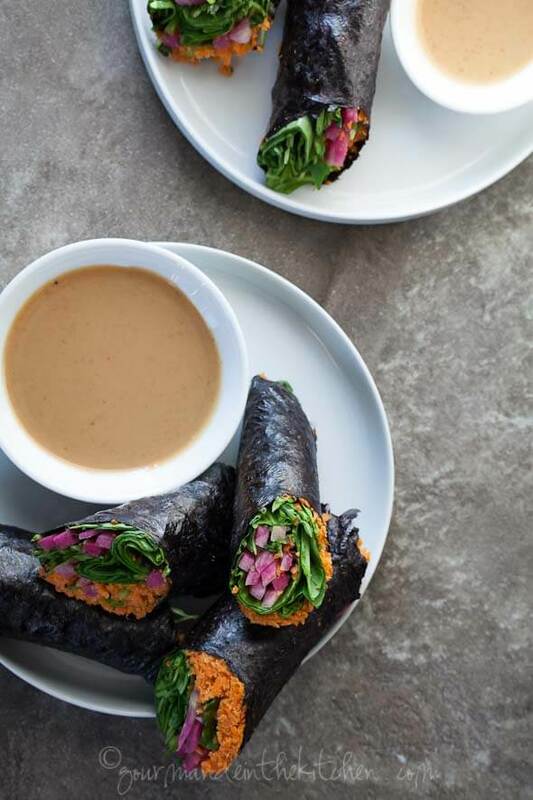 Shredded carrots, strips of radishes, spinach leaves and sprouts are wrapped in a nori seaweed sheet and rolled to create a delicious portable snack or meal. Sunflower seed butter, coconut aminos, lime juice, red pepper flakes, maple syrup and sesame seed oil are combined to make the delicious sunflower butter dipping sauce- you are going to want to dip everything in this sauce after trying it once. These wraps are good alone but even better when dipped in the sauce. 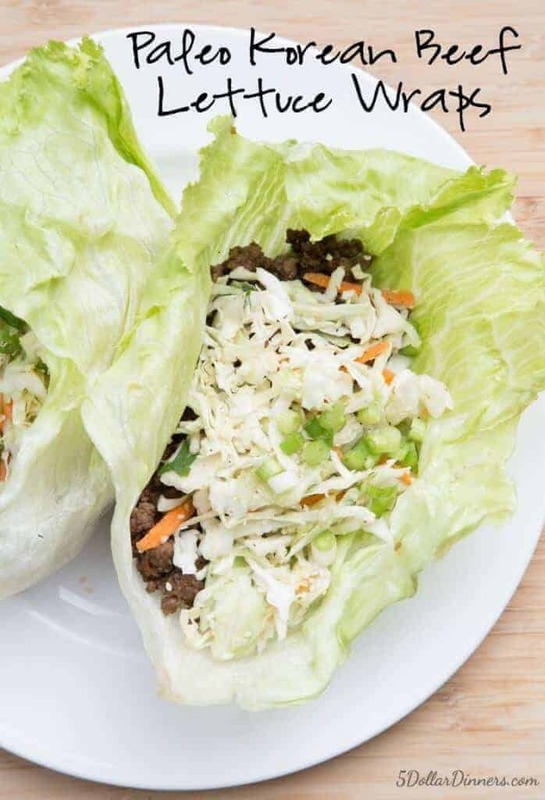 These Paleo friendly wraps start with a lettuce leaf and are topped with a sweet tangy slaw. Then a layer of sliced avocado and a layer pan seared shrimp are added. Then an optional layer of thinly sliced jalapenos and a sprinkle of cilantro are added. If you don’t like spicy food you can skip the jalapenos, but if you love jalapenos, pile them on! 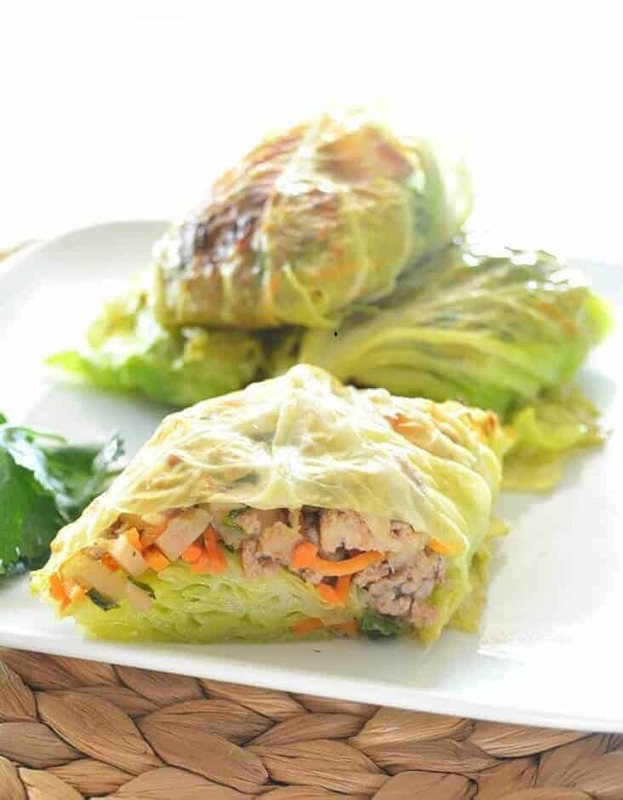 Ground pork, shiitake mushrooms, shredded carrots, onions and cabbage are cooked in a skillet then wrapped in steamed cabbage leaves and secured with a toothpick in this delicious recipe. Included is a recipe for the optional Thai sweet chili sauce. The Thai sweet chili sauce is better than any bottled sauce you can buy so do yourself a favor and make this. Ground beef is cooked in a skillet with green onions and a sauce made from brown sugar, soy sauce, sesame oil, garlic, ginger, rice wine vinegar, and red pepper flakes. The beef mixture is served over top a lettuce leave and garnished with extra green onions and sesame seeds. This dish is loosely inspired by the Korean dish of bulgogi. This recipe is super easy and will impress your friends or it’s perfect for a date night in. 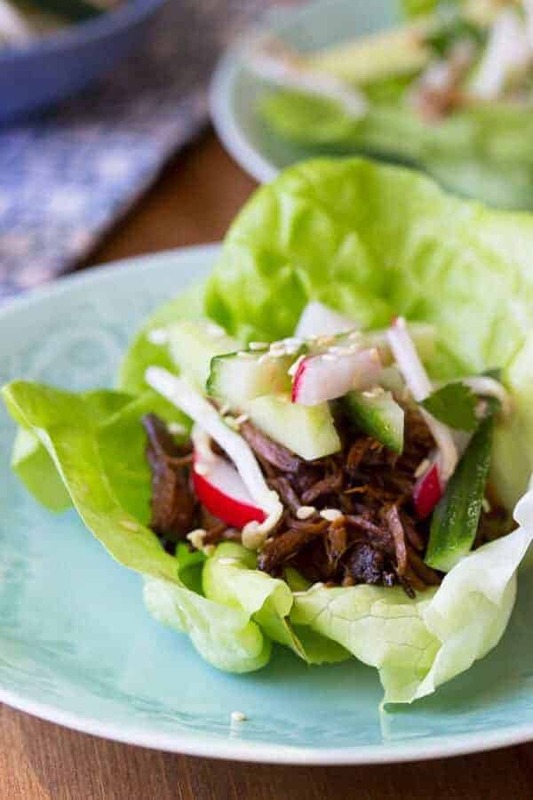 Wrap the lettuce leaf around the beef for a great meal to take on the go. A rib eye steak is frozen and thinly sliced then marinated in a mixture of soy sauce, sesame oil, sugar, garlic, ginger, pear, sesame seeds, red pepper flakes and black pepper. The marinated beef is cooked in a skillet with onions. Because the meat is thinly sliced it won’t take long to cook at all. 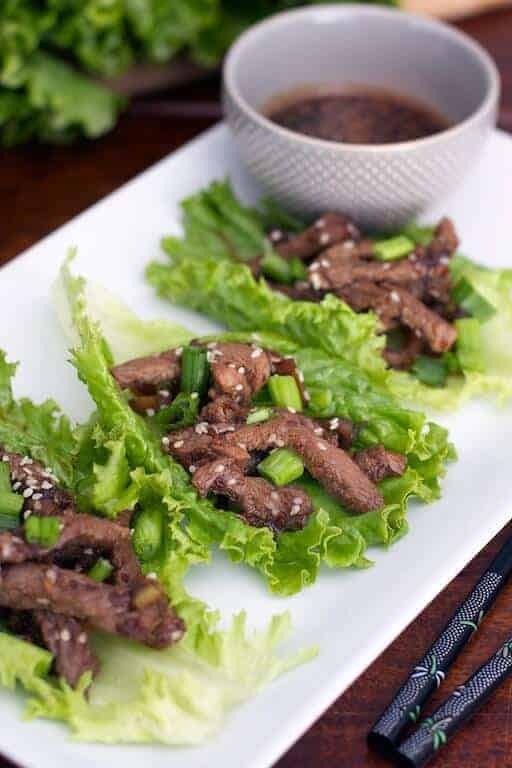 Once the beef is cooked it is spooned onto lettuce leaves and garnished with more green onions and sesame seeds- just paleo perfection! Every good Paleo wrap list must include spring rolls. Spring rolls can be filled with all kinds of ingredients from cabbage and other veggies to meat or sauces. They can be served raw or be fried. That can be eaten plain or dipped in a sauce. This article shows you the basics of how to roll spring rolls that can then be eaten fresh or fried. 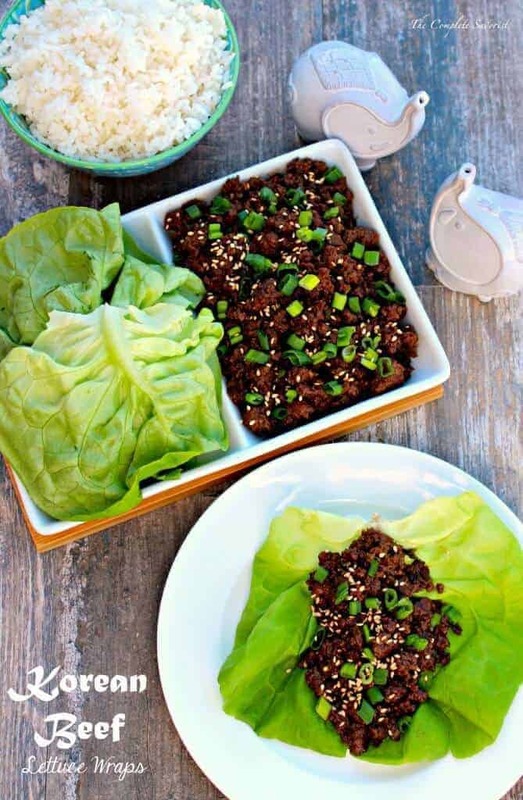 These Korean beef lettuce wraps use ground beef that is browned in a skillet with onions and garlic powder then cooked with a mixture of soy sauce, sesame oil, ginger, salt and pepper. Shredded cabbage is tossed with cilantro, sesame oil, canola oil, vinegar, ginger, salt and pepper to make a tangy and crunchy slaw. The ground beef mixture and slaw are rolled up in a lettuce leaf and topped with a garnish of sesame seeds and green onions. So many flavors come together perfectly in your mouth! These tortillas are gluten free and vegan. Using powdered psyllium husk makes them very pliable. The psyllium husk is mixed with brown rice flour, tapioca starch and spinach to create a incredibly pliable and gorgeously green container for your favorite Paleo wrap recipes. 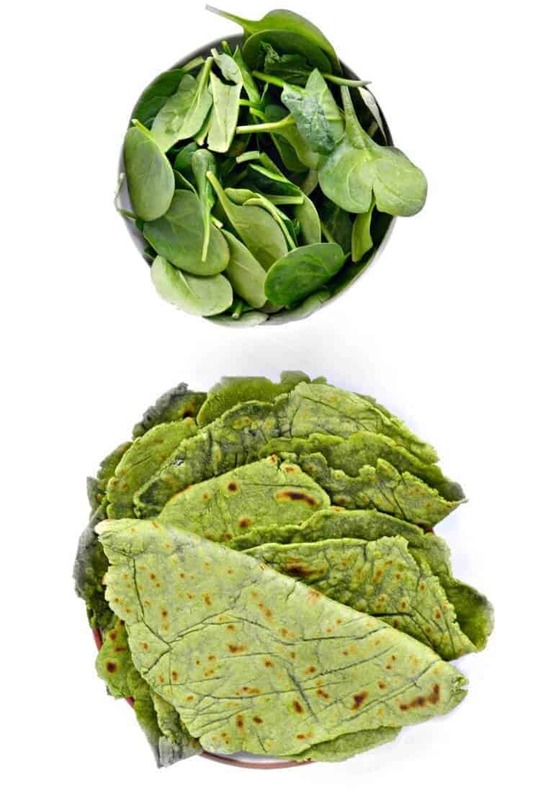 These will make wonderful wraps, tacos, breakfast burritos or even crusts for mini pizzas. 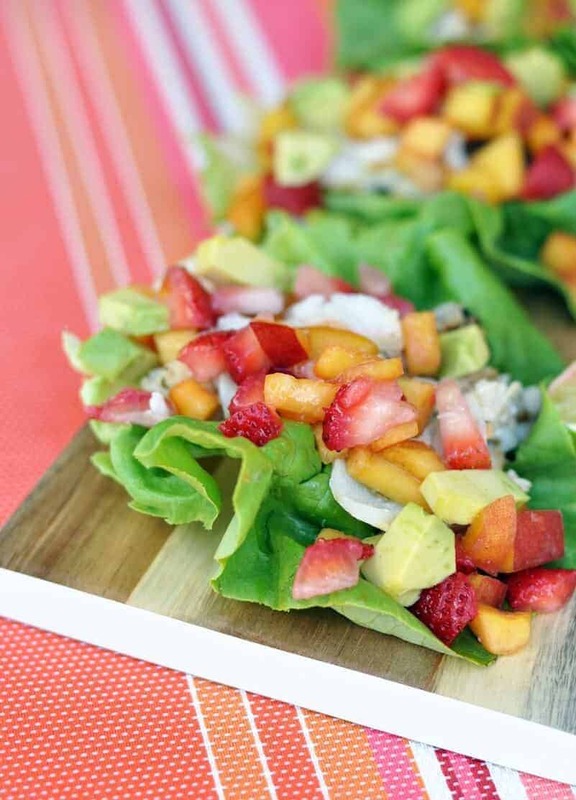 Make a bunch and freeze them for the next time you need a great wrap! These eggy tortillas are made with eggs, almond flour, arrowroot powder and spices to create a savory container for any filling you like. 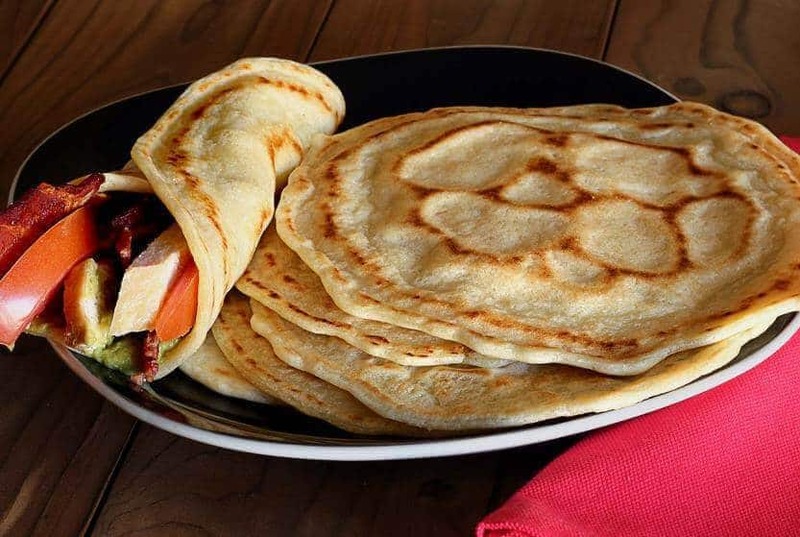 Although this recipe was made with breakfast in mind, you can use these tortillas for any meal. Fill them with meat and veggies or swap the spices for something sweet and fill with fruits or other crepe fillings. 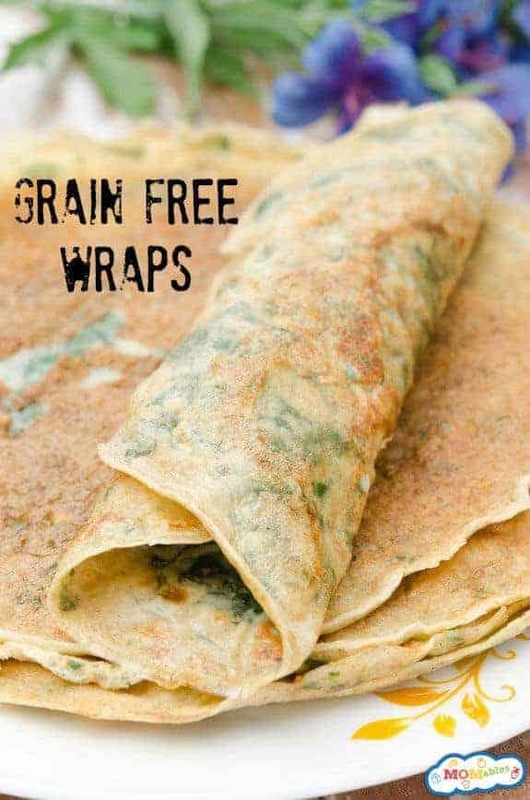 These versatile wraps are made with eggs, coconut flour, almond milk, spices and nutritional yeast which adds a cheesy flavor. These wraps are great warm or cold and can be used to refashion left overs. The garlic powder can be omitted to use with sweet and fruity fillings. You’re going to love this one for sure! 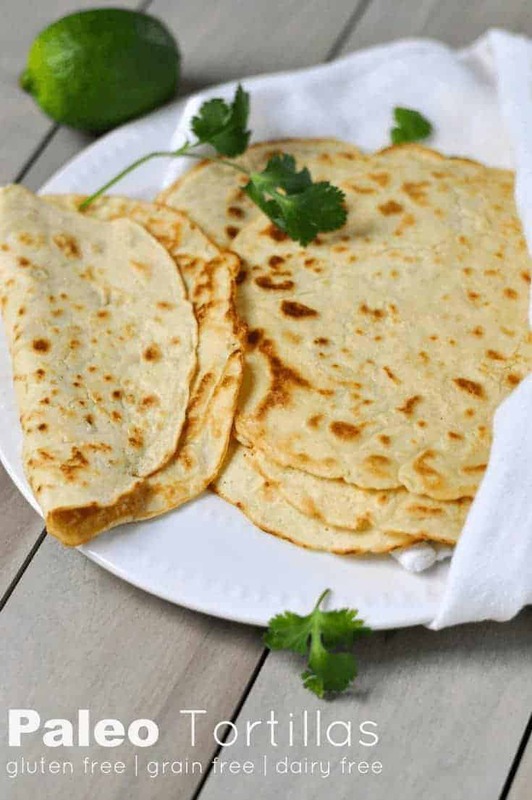 Cassava flour is used to make the tortillas in this recipe. They are flexible and soft, perfect for a soft shell taco or wrap. They are also very easy to make. These basic tortillas may just become your go-to Paleo tortillas as you can do practically anything with them. You can make up a big batch and freeze them to always have some on hand. A beef roast is cooked for 6-8 hours in a slow cooker with soy sauce, honey, brown sugar, vinegar, sesame oil and garlic chili paste. Then it is shredded and spooned onto a lettuce leaf and topped with a sesame cucumber salad. The sesame cucumber salad is made by combining match stick slices of cucumbers, thinly sliced radishes, and bean sprouts with rice vinegar, sugar and sesame oil. 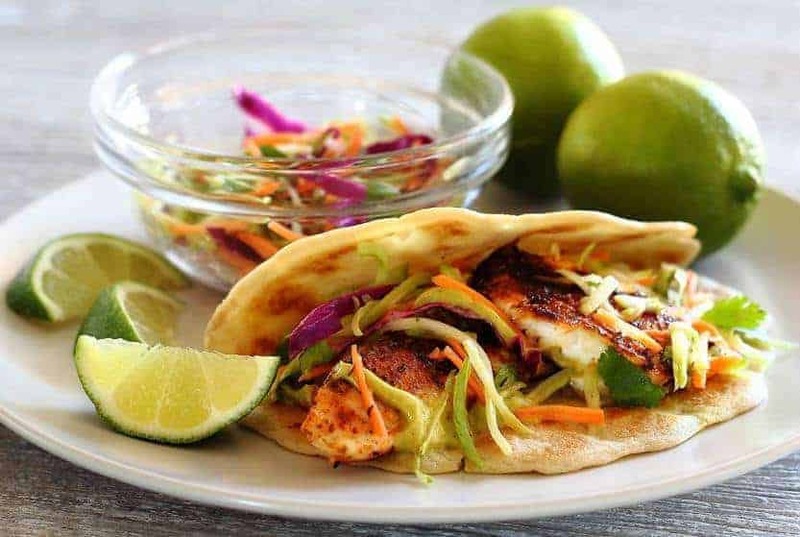 These spicy tacos are made with tilapia which is a mild white fish. Tilapia doesn’t have the fishy taste that some people might not like so it is perfect to use in this recipe. For extra texture and flavor the Tilapia is topped with a lime slaw and an avocado cilantro sauce and nicely wrapped in a Paleo tortilla. Subtle flavors yet something that will definitely wow you. In this recipe crab meat is combined with Paleo mayo, scallions, red pepper flakes and lime juice. 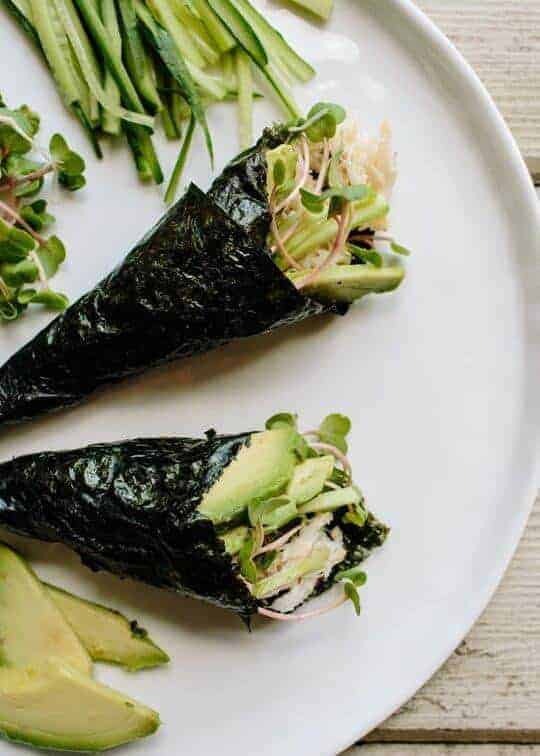 Then the crab mixture is spooned onto a nori seaweed sheet and topped with avocado, cucumbers and sprouts and rolled up into a portable roll that is perfect for on the go. Or if you prefer you can pack them in your lunch box and take them to work with you or on a picnic. Sometimes it may feel like being on a Paleo diet is too restrictive or that a wrap is off limits to you now. These 50 recipes prove that you can enjoy all kinds of wraps. From tacos and enchiladas to wraps and rolls, from breakfast burritos and crepes to gyros and flatbread, the options are endless. Tortillas are not off limits, they just need to be made with Paleo friendly ingredients. Hopefully, this list will inspire you to try the wide variety of tortillas and wraps that are available to us on the Paleo diet.